Thank you each and every one for visiting our website! We pray that this site as well as our CDs and DVDs will prove to be a blessing to you in your walk with our Lord and Savior Jesus Christ. In the book of Ephesians, the Apostle Paul tells us to "Be filled with the Spiritspeaking to yourselves in Psalms and hymns and spiritual songs, singing and making melody in your heart to the Lord." The Good Lord has opened many doors for us to sing these wonderful Gospel songs to many folks, so that now our music is sent out to numerous places far and wide. We count it such a great blessing to be able to sing the Gospel of our Lord and Saviour Jesus Christ to all these dear peoplevery many we will never meet in this life. We understand that our call is to ministerit is strictly the Lord's work, not the entertainment business. 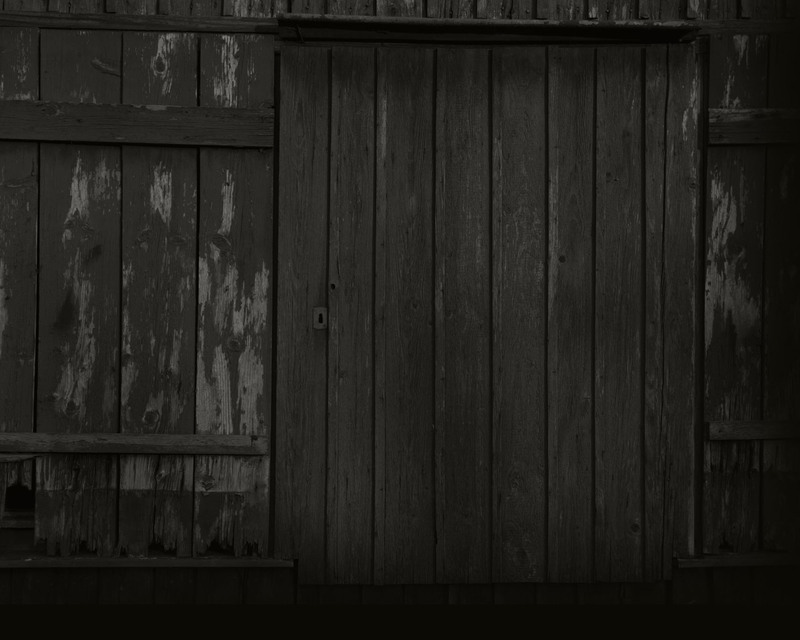 We wanted to introduce you to our family and invite you walk with us on a historical journey of our heritage. We pray that this brief glimpse into our simple beginnings will be a blessing and inspiration to others who dare to do something bigger than themselves for Jesus Christ. The 1920's ushered into American culture many of this century's greatest sounds. This was a period when general consumer items were mass-produced and made affordable to the common family. Phonographs and radios developed a demand for radio performers and recording artists. Ruralists saw the beginning of the acceptance of their music into larger markets in the twenties. In 1923 the first "hillbilly" record was recorded in Atlanta, Georgia. It was Fiddlin' John Carson who performed "Log Cabin in the Lane" and "The Old Hen Cackle". 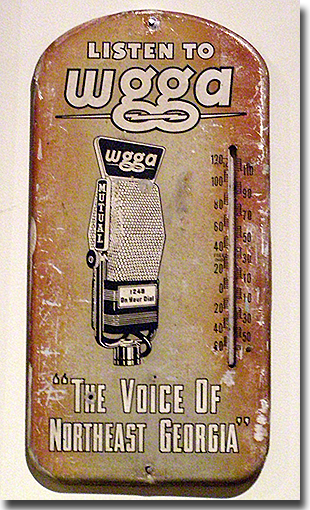 Two southern radio powerhouses featuring live entertainment, WSB Atlanta, Georgia, and WSM Nashville, Tennessee, opened their airwaves. Many historians recognize 1927 as the beginning of country music in the recording industry, with the release of "Weeping Willow" by the Carter Family, and "Sleep, Baby Sleep" by Jimmie Rodgers. 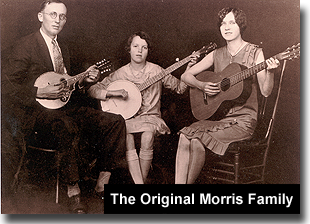 The year of 1927 also marks the beginning of country's first gospel group, The Morris Family. The Carter Family had a tremendous influence on us, according to Fanny Lou Morris Ringeisen, member of the original Morris Family. The new country releases encouraged our family to work at their music and songs. The Morris Family began their playing and singing, as with many others of the era did, within the influence of their warm home and church environments, in and around Lumpkin County, Georgia. Since the family patriarch was also a minister of the gospel, this made their brand of homestyle pickin' and singin' extra special. Joining in at the old time singing conventions provided a wealth of experience for the family. At that time, the Morris Family band included Rev. Frank Morris, who played the mandolin, Fanny Lou Morris Ringeisen, who played the guitar, and Girlie Jean Morris who played the banjo. Rev. Frank Morris was the pastor of Wahoo Baptist Church, one of North Georgia's oldest churches, formed in 1819. The good association of Rev. Morris with other churches throughout the lower Appalachians, along with his closeness to many of Georgia's political personalities, assisted the Morris Family in securing performances at political rallies, church services, and community events. His sister, Fanny Lou Morris Ringeisen, contributed much to the early sound of the Morris family. She borrowed twenty-five dollars from her brother, Herbert Morris, who was then in the U.S. Navy, to purchase a Washburn guitar to play in the band. She still cherishes that guitar in her home in Albuquerque, New Mexico, as she does the banjo which was played by her niece, Girlie Jean. Since Girlie Jean was only eight years old at the beginning of their musical career, many times the heavy banjo would have to be placed on a stool so Girlie Jean could play it. In the early days of radio, the Morris Family found their music in demand by the radio audience. They made regular visits to two Georgia radio stations from which their programs were heard, WTFL of Toccoa, Georgia, and Atlanta's WSB, a 50,000-watt giant. The groups appearances spurred the interest of the owners of Vocalion Records, the Brunswich-Balke-Collendar Company, and on March 20, 1930, the Morris Family recorded their first songs at the WSB Biltmore Hotel Studio. They recorded "Oh Mary Don't You Weep", "He Rose Unknown", "A Dream of Home", and "Will it Be You". These songs were released nationally by Vocalion Records. As the years progressed through the Great Depression, younger members of the family became involved in music. Miss Frankie Morris began playing the piano. 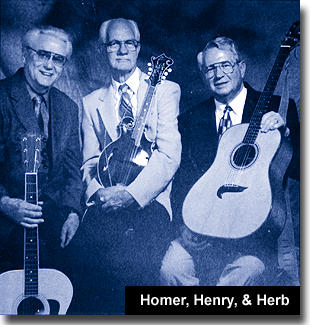 As brothers Herb, Homer, Vaughan and Gene grew, they began playing various instruments and harmonizing together and by the early 1940's, they could really sing a song. In 1944, after a long illness, Rev. Frank Morris went home to be with Jesus. This was a great loss to this family and especially to these four young boys. But by God's grace, they were able to continue, as dad would have wanted them to do. 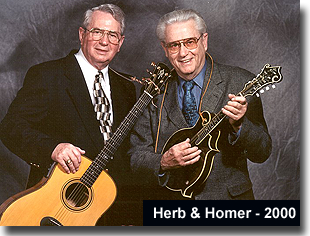 In March 1945, brothers Herb, Homer and Vaughan decided to continue performing as the Morris Brothers. They added Henry Moss, a young fellow from North Carolina, as a tenor singer and mandolin player. Henry later married original Morris Family member, Girlie Jean Morris. The Morris Brothers continued in the tradition of their family, performing at schoolhouses, community centers and singings. The Morris Brothers show was on the airways in Georgia. The group began at WGGA in Gainesville in 1945 and 1946. The band then moved to the big city of Atlanta and appeared daily on WGST. 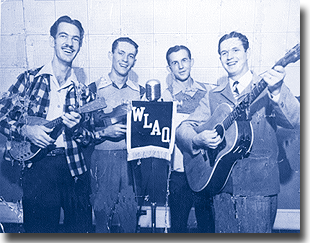 During this period, the Morris Brothers program was broadcast live each morning at 6:00 AM and Bill and Earl Bolick, the Blue Sky Boys, were broadcast at 7:00 AM. 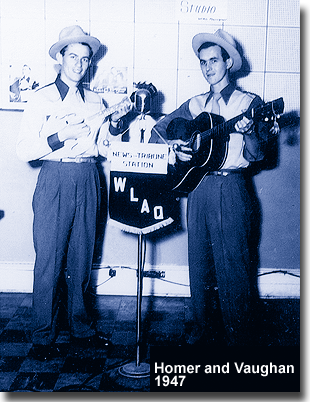 Later, the Morris Brothers moved to Rome, Georgia, to WLAQ, where they remained until 1949. After leaving Rome, Georgia, the brothers left radio and performed only on stage. For several years during this time Homer and Vaughan made up the duet portion of the Morris Brothers show. The next few years saw the family spread about throughout the country. Homer answered God's call to preach the gospel and entered school at Tennessee Temple. Vaughan and Herb entered the business world in Atlanta, Georgia. Gene went into the U.S. Army. After Homer completed college, he and his wife Pauline went to the mission field in Mexico for several years. However, all the boys continued to work with their music. And in 1974, the Lord brought the brothers together again. They began to record and perform at concerts and there was a renewal of their radio program in different parts of the country. The big difference from their radio program of earlier years was that this time it was on tape and on several radio stations daily. No more getting out of bed at 4:00 AM to make a 6:00 AM live broadcast. My, my, what a country. Gene and Vaughan went home to be with Jesus in the mid 1970's. They are still missed so very much, but this family is awaiting the great family reunion when we all will be together forever to sing as a family again around the throne of God. Life has been wonderful to this family, and in spite of the ups and downs of life's road, they have been able to laugh as well as cry. Thank God for the humor as well as the hardships. 1978 saw the release of two Morris brothers albums, "Paradise Valley" and "Turn Your Radio On". 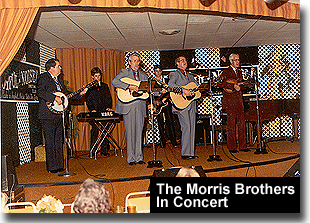 In 1979, The Morris Brothers released the album, "A Song in My Heart"
It's good to look back on the times when they were kids living in North Georgia. Herb and Homer along with cousin Ira, roaming the pastures and hillsides, coming upon a tree that was tempting to climb. Herb and Ira were trying to talk Homer into climbing the tree...Persimmons or some treasure was in the tree they wanted to reach...well, it was a long way from the ground to the treasure, and no elevator or ladder...Herb and Ira gave their solemn word that if Homer fell, they would surely catch him. Well, with assurance like that how can you fail?...rather, how can you fall? But fall Homer did...and where were Herb and Ira? Well, need we finish the story? Just in case you are interested, sure enough, a limb broke and down comes Homer...not in the arms of Herb and Ira, mind you. But in the arms of solid mother earth..banged...bruised...battered. Then there was the time Rev. Morris had a beautiful and prized bean field he had planted and worked so hard to raise. Well, as he was going into town one day, he left instructions for Herb and Homer to put poison on his beans to kill the beetles. As it turned out, Herb and Homer got hold of the wrong poison...and yes, they spread it all over their dad's prized bean field and burned his whole field of beans to nothing but dried leaves and vines. In other words, they ruined them. I suppose it's only by the grace of God that they didn't ruin themselves. In 1982, Morris Brothers released the album entitled, "Hands of Jesus". "There are very few times in our lives when we hear a song that reflects the sentiments and captures the story of the group is singing about so vividly. Homer Morris of the Morris Brothers, Marietta, GA expressed in words the thoughts and heartaches of millions of Americans across this great country of ours when he so eloquenty penned the song entitled, "Flight 007". As You listen to this song, may God's blessings be upon this great nation of ours, and it is my prayer that this song will emphasize the need for all of us Americans and freedom loving people to "Stand Up For Liberty." "In the 23 years Perfection Sound Studios has been in the recording business, recording over 900 different groups, NEVER HAS THERE BEEN SUCH INITITIAL RESPONSE TO A SONG! Perfection Sound Studios unite in saying: 'God Bless You Homer' For writing what we have all felt since this tragic moment in history." 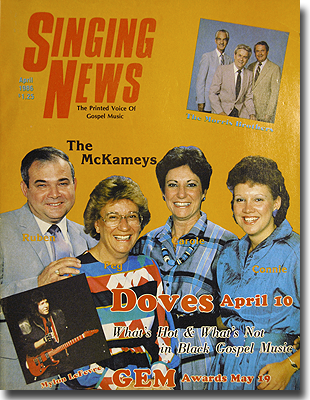 In April 1986, The Morris Brothers were featured on the cover of the magazine, "Singing News". (click for PDF file of magazine cover and read the article). 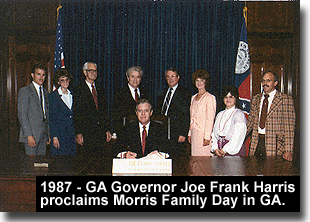 In 1987, Georgia Governor Joe Frank Harris signs proclamation honoring the Morris Family's contribution to the music industry and proclaims "Morris Family Week". From 1927 to 2000, seventy-three years...yes wonderful years of being involved in family music they love. The present Morris Brothers group consists of Herb and Homer, and Homer's two sons, the younger Morris Brothers, Kent and Philip. And the one who has been there since 1945, a brother-in-law to Herb and Homer, their buddy, Henry Moss. The Morris brothers have recorded 24 albums, some country gospel, some bluegrass gospel and some southern gospel, and we are making available to our many friends and listeners some of all the different sounds this talented group has produced over the years in this new box set. We have carefully chosen songs and instrumentals that cover the 73 years from 1927 to 2000, the very best of the Morris Family and the Morris Brothers, songs you cannot get on any other product. The brothers have had their music distributed to radio stations nationwide for the past 25 years, also some singles have been released in foreign countries. 1990 brought the release of The Morris Brothers album entitled, "Gloryland". In 1991, "The Hands of Jesus" was re-released. 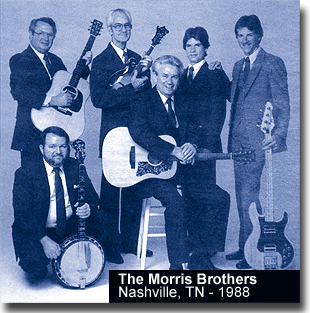 In 1992, The Morris Brothers released, "Nearing the Border" and in 1996, "Morris Brothers Country Bluegrass Gospel" was released with much delight. 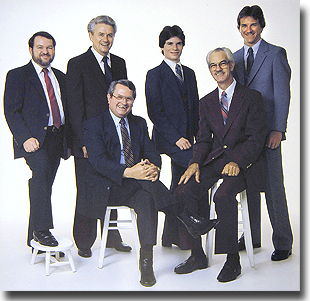 The 1990's culminated with the release of the boxed set of 80 classic songs from the Morris Brothers Gospel Bluegrass hits spawning from 1927 through the dawn of the new millenium in 2000. Wherever the Morris Brothers go with their music, they are received with love and respect. They can boast of having good friends north, east, south and west, who respond to their brand of singing the good old gospel songs with great enthusiasm just like the original Morris Family was received. When you tune in your ear to this new Morris Brothers box set you will hear a sound that has been going on for a long, long, time...a sound that is unique to the Morris Family, and a sound that is unique and distinctively, the sound of the Morris Brothers. Aunt Fanny Lou Morris Ringeisen, and the Morris Brothers' sister, Frankie Morris Smith, are the only living members of the original Morris Family as of this writing. Aunt Fanny Lou lives in Albuquerque, New Mexico, and at 92 years young, is such a wonderful blessing to the whole Morris Family. we love you, Aunt Fanny Lou! Sister Frankie Morris Smith lives in Marietta, Georgia with her husband, "Smitty." They are retired and enjoying life. She is still a mother-like sister, to Herb and Homer, checking on them on a regular basis to make sure everything is okay with them. She is a wonderful sister, mother and supporter of this family's music. She is much loved. Girlie Jean Morris Moss went home to be with Jesus two years ago. She is missed so very much. A wonderful sister and mother, true friend to those she knew. She is now singing with the family members who have gone to be with Jesus as they await the remaining family members to join them. Girlie Jean was a very musically talented lady, and was an outstanding music writer. As you listen to "Homesick to Go," or "Glorious Things," you will experience the great writing talents of this dear lady. 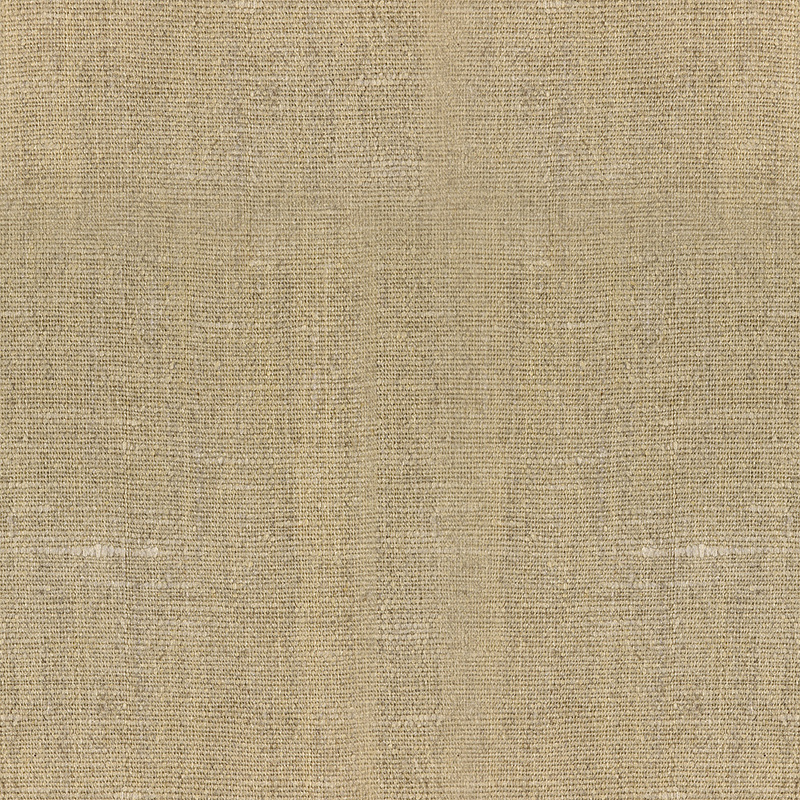 "Vintage-Plus" (listen to samples here) which contained the #1 song, "Peace With God". 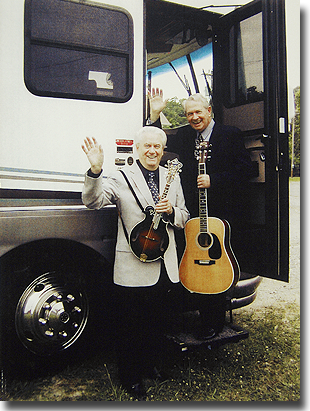 2006 ushered in the release of the CD entitled, "Blue Ribbon Bluegrass Gospel" which featured Paul Brewster and Andy Leftwich (listen to samples here). This CD also featured the #1 song, "Working On A Building". 2007 brought the CD, "Calvary's Hill" (listen to samples here) and along with it, three more #1 songs"Walking My Lord Up Calvary's Hill", "Ashamed to Own the Savior", "At Mount Calvary (Early One Day)". The Rural Roots Music Commission, a subsidiary of the National Traditional Country Music Association, selected "Calvary's Hill" as the 2008 Country Gospel CD of the Year (view PDF here). 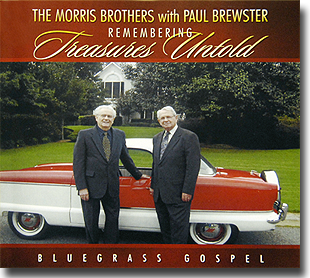 2008 also witnessed the release of the CD, "Remembering Treasures Untold" with Paul Brewster (listen to samples here). This CD featured two #1 songs on the national charts"Good Morning Lord" (view PDF here) and "I Will Not Be A Stranger" (view PDF here). 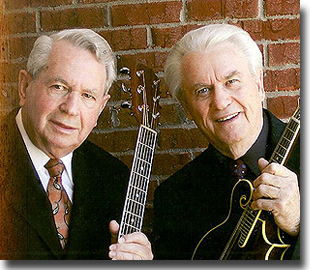 In addition, in 2008, in accordance to the by-laws of the National Traditional Country Music Association, Inc., and the wishes of its membership, The Morris Brothers were inducted into America's Old Time Country Music Hall Of Fame (view PDF here). In May 2009, "Ashamed to Own the Savior" from the CD, "Calvary's Hill" climbs to #1 on the GTE Magazine National Christian Country Bluegrass Gospel Charts as compiled from USA airplay (view PDF here). June, 2009 also marks the date that The Morris Brothers were recognized by GTE Magazine as the "Most Played Overseas Gospel Artist" (view PDF here). 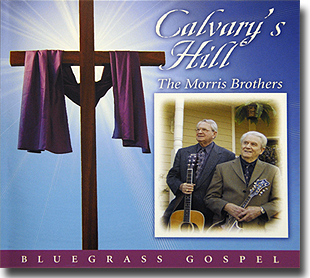 In this same issue of GTE Magazine, The Morris Brothers were featured in a tribute article entitled, "To God Be The Glory, Great Things He Has Done" (view PDF here), Later, In August, 2009, "Good Morning Lord" again from the CD "Calvary's Hill", received this same coveted recognition (view PDF here). 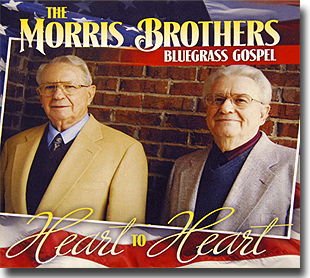 2010 marks the year of The Morris Brothers Gospel Bluegrass' award winning relaease, "Heart To Heart" (listen to samples here). "Heart To Heart" has three #1 songs on the national charts, "Cry, Cry For America" (view PDF here), "Not Just A Guest" (view PDF here) and "Walk on Holy Ground" (view PDF here). In August, 2010 GTE Magazine released a second tribute article on The Morris Brothers (view PDF here). 2011 marks the release of the Morris Brothers' 14th album, "Ridin' the Gospel Rail" which includes many of the old train-style songs all of us love (listen to samples here). 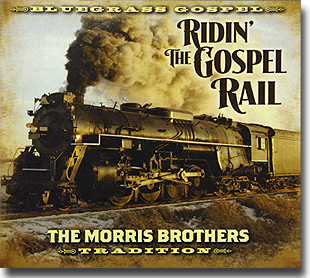 The Morris Brothers released two DVD box sets in 2011 - "Moving Higher" (view sample) which showcases a collection of the Morris Brothers' new songs from the "Ridin' the Gospel Rail" CD as well as old-time classics like "The Pale Horse and His Rider"and "The Morris Brothers In Concert" (view sample) which showcases the Morris Brothers' intricate harmonies amd outstanding arrangements in a concert setting as inviting as a family reunion. 2011 also marks the launch of the Morris Brothers' New Website, Youtube Channel (visit Youtube Channel) and Facebook page (visit Facebook page) to reach even more souls for the Lord Jesus Christ. 2012 marks the release of the highly acclaimed CD, "Reflections...No Other Fountain" which includes a variety of diverse styles and melodies which are sure to become classics (listen to samples here). 2012 also marks another #1 song on the GTE national charts as "Not Just A Guest" climbed to #1 in the September 2012 issue of GTE Magazine (view PDF here). "Not Just A Guest" is off the Morris Brothers' award winning cd entitled, "Heart-To-Heart", released in 2010 (listen to samples here). 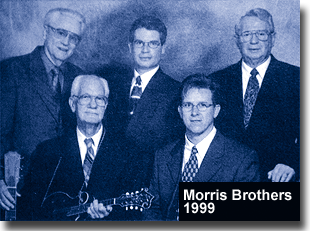 The Morris Brothers still enjoy traveling and singing the Gospel at venues and churches all across the country. All proceeds from CD/DVD sales and profits from touring dates go to fund "Missions For Jesus International", a Christian non-profit ministry founded by Homer and Pauline Morris over 40 years ago while they were missionaries in Mexico. Missions For Jesus International is a mission work where every cent raised goes directly to support missionaries on the mission field. "It is the belief of Missions For Jesus International that it is the will of God for our precious missionaries to be able to stay with their work and their people full time and not have to leave for periods of time in order to raise the funds necessary to continue to do the job that God has for them to do." Homer and his wife Pauline make their home in Acworth, Georgia. Their sons Kent and Philip have been a part of the Morris Brothers Band since they were very young boys. Herb and his wife Virginia make their home in Marietta, Georgia. They have three children, Ronald, Donna, and Randall. It is our belief and prayer that everyone who buys our box set, our latest release, "Ridin' The Gospel Rail", or any of our other individual CDs will be blessed by the unique sounds of the original down home music which began in 1927 and is very much alive today. May the grace of God be with you all...is our prayer. 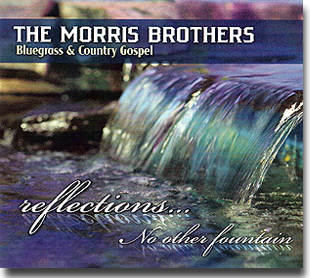 This site © 2012 Morris Brothers Gospel Bluegrass, Inc. No images or music from this site are to be used without the expressed written consent of Morris Brothers Gospel Bluegrass.